The Japanese poetic genre, tanka, literally means 'short song'. From the Heian Era until about 1900 tanka was known as waka or 'Japanese song'. The change of name indicated an opening up and sharing with western poets and readers, but to this day in Japan, it is possible to sometimes hear tanka chanted in the traditional way. It is now written in many countries around the world in a growing number of languages. In 2013, editors Libby Hathorn and Rachel Bailey selected three tanka from my collection 'empty garden' [Eucalypt 2006, reprinted 2013] for inclusion in an anthology of seventy-eight poems, titled "Women's Work: a Collection of Contemporary Women's Poetry" published by Pax Press. In November 2013, twenty-two of these poems were presented in the Radio National programme, Poetica. Music for this programme was written and performed by Melbourne composer and musician, Andrea Keller. So it was through ABC Poetica, that the highly regarded musical trio of Andrea Keller (piano), Tamara Murphy (double bass) and Allan Browne (drums), regular performers at Bennetts Lane, Melbourne, became aware of my tanka from 'empty garden' as published in 'Women's Work'. Subsequently Allan Browne recorded his reading of these tanka in a gig in the Bennetts Lane small room in February 2015, to music composed and played by Andrea. In April 2015 I was surprised and delighted to receive an email from Andrea Keller, requesting permission to include a reading by Allan Browne of my work in a CD titled 'Travellers', planned for release by Jazzhead. 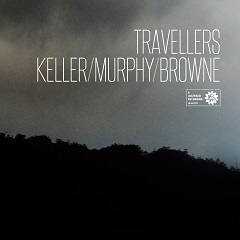 Deeply missed by his fellow musicians, Allan Browne died in June 2015, but the launch of the CD 'Travellers' (Keller Murphy Browne) was celebrated on December 7, 2015. For me, this is yet another experience of how the Japanese poetic genres of haiku and tanka can be shared around the world, and how readily they combine with painting, music and calligraphy, each art gaining strength from the others. A few years ago, the first of the three tanka mentioned here, 'a lightning strike', was arranged for music and (singing) voice by US composer Robert Patterson for Luna Nova.